Students will learn to recognize sets of words that begin with the same sound in songs, speech, and poetry. Students will indicate beginning sounds recognition by responding with a physical movement. Recognizing beginning sounds is a basic component of phonemic awareness, a critical pre-reading skill. The auditory discrimination that students develop in preschool years or kindergarten prepares them for decoding and spelling words through phonics. 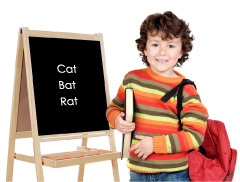 We can provide practice in recognizing the beginning sounds in words through alliteration and tongue twister activities. This lesson plan uses music, rhythm, and play activities to encourage students to listen, practice, discover, and create words and phrases with repeated beginning sounds. Each time a beginning sound is repeated, students respond physically, reinforcing the concept by including more of the total body in the learning experience. The imaginative and silly characters in Tongue Tangle have great appeal to students, giving them the feeling that they are playing, rather than learning. It should be stressed that, at this stage of development, recognizing beginning sounds is an auditory skill, rather than a visual one. In other words, students recognize similar sounds when they hear them but do not generally have the skill level to read or spell the words in the song. However, for students who already recognize some letters and sounds, song lyrics on the Mini-Charts can help build skills in spelling and reading simple words with the same beginning sounds. This lesson is the second in a series of five lessons. The previous lesson, Kindergarten Phonics Phonemic Awareness: Rhyming, teaches students to recognize words that rhyme. The next lesson in the series, Kindergarten Phonics Phonemic Awareness: Same and Different Sounds, teaches students to discriminate between words with the same or different beginning sounds. Optional: picture cards and/or objects beginning with the letters p, b, c, t, d, w, s, f, m, and g.
Note: If you do not have the CD or Mini-Charts, you can still teach this beginning sounds lesson plan using the folk tune listed on the Tongue Tangle Song Lyrics page. For this level, it is good practice to include pictures, for visual reinforcement. Say,“Let’s listen to this funny song and see if we can hear words that start with the same sound. You can sing along with the music on the parts of the song that repeat.” Play Sing Your Way Through Phonics Ready-to-Read! CD Track 2 and point to the Mini-Charts pages that illustrate the words. Students will be able to join in at the end of each verse (odd numbered pages on the Mini-Charts), if you lead them in the singing. Repeat the procedure for Step 4, reading the first or second sentence on pages 22, 24, and 26. Repeat the procedure for Step 9 for the pictures on pages 21, 23, 25, and 27. Page 21 pictures are car, trees, turtle, cake. Page 23 pictures are walrus, deer, watch, ducks. Page 25 pictures are sun, frog, star, fish. Page 27 pictures are mop, gloves, grasshopper, monkey. Replay and sing CD Track 3 but allow two students to tap the pictures in time with the repeated sounds. You may need to guide them by holding their wrist and helping them tap at the appropriate times. Using the Pictures on Mini-Chart page 28, see if students can match each picture with another picture having the same beginning sound. Answers: sun/star, bottle/bicycle, trees/turtle, cake/car, fish/frog, walrus/watch, monkey/mop, gloves/grasshopper, ducks/deer, popcorn/pencil. Practice singing Tongue Tangle every day for a week. Then try singing the song with the instrumental track on the CD (Track 4). Do the students remember all the words to the song? Review any that are giving them difficulty and use the pictures on the Min-Charts to aid memory. Help students create other sets of tongue twister words for the song. Make 5 copies of Mini-Chart template p. 80 or 81. Help students come up with new words for the blanks in this way. First, think of an object or animal beginning with the chosen sound (e.g., penguin, puppy, porcupine, parakeet, pencil, pineapple, potatoes, pajamas). If students have trouble coming up with their own examples, let them choose from a list that you supply. Next, help students think of describing words, including colors, that have the same beginning sound (e.g., purple, pink, pretty, polka-dot, playful, pesty). Again, let students choose from your list to get them started. Choose two describing words and one object or animal to fill in the blanks (e.g., pretty pink potatoes, or playful purple penguins). Replace one or more verses of the song in this way. You do not need to replace all of the verses. Allow students to illustrate the new lyrics in the boxes on the Mini-Chart template. Place pages with new words in a 3-ring binder in page protectors and sing with the instrumental track on the CD (Track 4). If you have not replaced all the verses, sing the original verses on the parts of the song that do not have new examples. Practice discovering and creating tongue twisters in Nursery Rhymes like Wee Willie Winkie or Diddle Diddle Dumpling. Students indicate that they know which words have the same beginning sounds by performing some motion on those words. Examples: clapping, snapping, tapping bending, jumping, exercise movements. Omit the original words and help the students supply their own substitute words with another beginning sound. Examples: For the /m/ sound-“Mee Millie Minkie runs through the town.” or “Middle Middle Mumpling my son John.” This works especially well with Nursery Rhymes that include nonsense words. Read tongue twister stories and poetry and ask students to indicate that they recognize the repeated sounds by performing physical movements or playing rhythm instruments on the words with same beginning sounds. The Dr. Suess book, Oh Say, Can You Say? is good for this purpose. Students who know some of their letters and sounds can help spell or write words with beginning sounds that they create for the song and can help read those words in simple books like Busy Buzzing Bumblebees and Other Tongue Twisters by Alvin Schwartz and Kathie Abrams. Order our cost-saving Sing Your Way Through Phonics Ready to Read Combo online ($33.95) containing the CD, Mini-Charts, Song Lyrics, and Teaching Suggestions — everything you need for this lesson! Or, print out an order form to mail/FAX to us.